A couple of benefits of being an InMotion WordPress Hosting customer is that we can migrate over your existing website or easily get you set up with a site that has WordPress already installed. At that point it's just a matter of logging in and getting started. If we didn't help you get set up, once you have completed the installation of WordPress you can login to your dashboard. 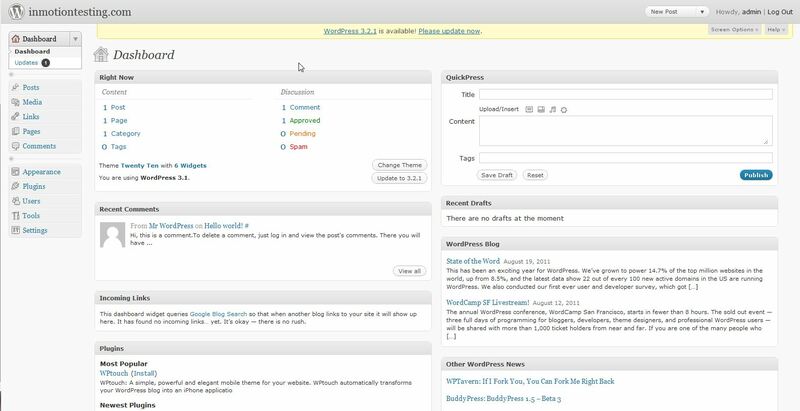 The admin section of WordPress, the "WordPress Dashboard", is where you will begin building your WordPress site. Please take note that your login credentials are not the same as your cPanel username and password unless you set them up as the same. 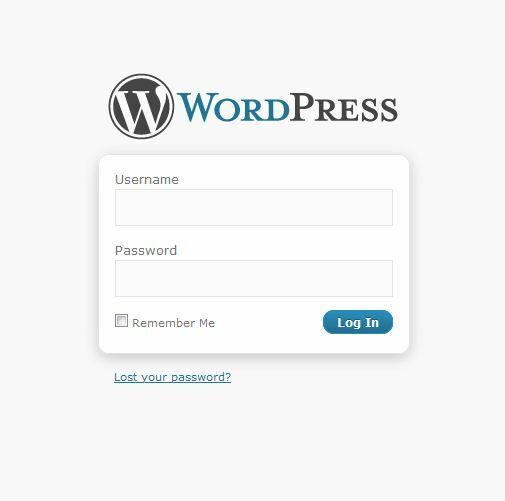 Type the username and password you used when you installed your WordPress. Once you login you will see the WordPress dashboard. If you installed WordPress on a new domain or on a domain that is not yet pointed to your account with InMotion Hosting, you will not be able to use the dashboard until you point the domain to our servers or until the DNS changes take effect. Until then, you can set WordPress up to use your temp URL which can be found in your AMP technical details. Please note: If you change WordPress to work using your temp URL, when you are ready to have the site go live, you will need to change it back so it will function using the real domain name instead. There are several reasons why you may be getting errors when trying to log into your WordPress dashboard. We will go over a few of the common ones. Many times, users simply forget their password. Luckily, we have written an excellent article on resetting your Wordpress password. Click the link below. For increased security, check out our full guide on how to enable two-factor authentication for WordPress. I'd advise contact our Live Support department so they can help verify your account. I can no longer log in to Wordpress since I attempted to update. i just get the following message. W3 Total Cache Error: some files appear to be missing or out of place. Please re-install plugin or remove /home/konjocom/public_html/wp-content/advanced-cache.php. Sorry for the problem with W3 Total Cache. The best thing would be to uninstall it manually. Check out the discussions in the WordPress.org Support pages. You can also see the official documentation on the error here. WP3 Total Cache is a 3rd party plugin, so you we do recommend contacting the authors of the plugin for more detailed assistance. Hi it worked before but now I just noticed 404 that page not found when I typed "https://example.com/wp-login/", but it shows the log in page if I enter "https://example.com/wp-login.php". I recommend trying to rename your .htaccess file. You can also try to reset your permalinks. i've been trying to access my dashboard, but it keeps saying site can not be found. what do i do? isn't talktosmyle.wordpress.com/wpadmin suppossed to take me to mydashboard? Thank for your question regarding your talktosmyle.wordpress.com domain and its access to the WordPress Admin. First, if you are using WordPress.com, then you are not using the WordPress standalone software that requires a host service like InMotion Hosting.com. In order to access the admin for WordPress.com accounts, you would go to WordPress.com and then login. I can tell it's a WordPress.com account by the URL (wordpress.com is part of the domain name). If you are trying to use that domain name to refer to standalone WordPress installation on a host, you would need to map that domain to our server. Per Wordpress you would need to go to Domain Upgrades in their interface in WordPress.com. You may also want to consider registering the domain "talktosmyle" using some Top level domain (TLD) extension like .com, .net, .org, etc. There are hundreds of available to you through a domain registrar. If you do have separate hosting account with us or another host, then we recommend that you change the domain name. At this point, the "talktosmyle.wordpress.com" domain name points to the WordPress.com servers. As I mentioned above, WordPress requires that you go to Domain Upgrades to allow mapping so that it can point to an outside resource. This will have something to do with the URL that you're going to when logging in. What URL are you using to login? Also, are you using any plugins for security? By default, the WordPress login goes directly to the Dashboard. If it's been altered, then it's a setting or plugin, or some change that you have applied to your site. Check your General Settings, the URL should be domain name of your WordPress site. You should also make sure that you don't have any re-directs set up that could be bringing you to a different page. If you require further assistance and you are an InMotion Hosting customer, please contact our live technical support team (contact information at the bottom of the page). Hello, I would appreciate to get some support on a specific issue. example.com/blog/wp-admin does not work as well. Any other option to find the log in site? If you are sure that your domain name is correct, then it will be difficult to troubleshoot that with access to the server where the website is being hosted. I would recommend that you first check the domain to make sure that it has not expired (which is always possible). If the domain is pointing to the right server and still active, then I recommend contacting the hosting service for assistance in getting to the WordPress site. This can sometimes happen when the database is corrupt or if there is a security program that has changed the login URL for the WordPress site. Is it possible to get the Cpanel login details from within the WordPress admin login? If so, how? For security reasons, it is not possible to get cPanel login credentials from within WordPress. If you are locked out of cPanel, I suggest contacting our Live Support team. Once proper account verification has been received, they can help you log back in. Sorry for the issues with the website. You will need to double-check the URL that you used for your website. It should be something pointed to your WordPress site. If you're still having problems, then please contact your host's technical support. If you're an InMotion customer, you can find the contact information at the bottom of the page. I am unable to reset any of the admin passwords on my site! I add the user name (ifor wp-admin (I have two), get the password reset link in email, create a new password or ue the default and it still does not work!!! I recommend resetting your password WordPress password directly in the database. LOOK at problems and issues when the answer is "simply" do this. I have grown to DESPISE the words "Just" and "SIMPLY.' Clearly, if it was something that simple there would be no discussion. I cannot get in with either wp-admin or wp-login.php because it "simply" just spins and the admin window just simply doesn't show up. We are happy to help you troubleshoot your website issues, but will need some additional information. Can you provide a link to your site for us to test further? Is it possible to access the wp dashboard using a cell phone? I would like to be able to do that to work on some minor site issues when I am out and about. Thanks. The WordPress dashboard is mobile friendly so you should not have any trouble doing basic WordPress tasks from a mobile device however some menus from themes or plugins in the dashboard may not be mobile friendly. I recommend disabling any plugins (through cPanel) that you have running that integrate with the Users or Login page. They may be disrupting the login process. Hi I recently started helping on a website. theonemanband.us and the owners couldn't even tell me which site they used to create it. They haven't touched it in years! Page source let me know that it was a wordpress site and they eventually also could tell me that they are hosting through ipower.com. However, I can't get into any sort of dashboard or admin. I can get into their ipower hosting account but as far as I can tell they don't have any sort of plan with wordpress. when I put in http://theonemanband.us/wp-admin I get a 404 page. I'm lost. I have no idea what they've done (or haven't done) how do I get to the admin page? You must gain access to do some file management in order to discover if they have WordPress core files installed. If they don't then they're not using WordPress and you may need to install it. You can install WordPress manually or, if you don't have access to their hosting account, the host's support team must provide assistance. I'm new to this and am trying to start my first site. I bought the domain and hosting through hostgator. After I install wordpress using quick install, I type in the website www.example.com/wp-admin and I get an error saying "www.example.com's server IP address could not be found". And that the "ERR_Name_Not_Resolved". Can anyone please help me? If you just purchased your domain, then it may take 4-24 hours for propagation before the domain will work. There may be additional steps to take with Hostgator, I am not familiar with their services to advise. You may want to contact them should this persist beyond 24 hours since you registered the domain. Thank you for this article, it got me where I needed to go. I am upgrading my wordpress site to https. My issue is that as the first step I updated the url to https in the General Settings screen and saved the updates. Now I can't gain access to the Wordpress admin site because I'm assuming there is some type of mismatch between the https and former http URL (perhaps the redirect from HTTP to HTTPS needed to be done first). Any ideas on how to log back into wordpress admin site to continue my HTTPS upgrade? I recommend you follow one of the methods outlined in our guide on Changing the Site URL and Home Settings. You should be able to regain access once you do. I have a log www.ahmetguvener.com. When I want to access my blog through www.ahmetguvener.com/wp-admin I get a blank page; nothing happens. Hence I can not update my blog. Any suggestions? Sorry for the problem with the blank screen when logging into WordPress. Check our article on troubleshooting this issue. If you continue to have the problem then please contact our live technical support team for additional assistance. You can find their contact info at the bottom of this page. I have recently moved from wordpress.com to wordpress.org. My domain name is kashyapeesays.com and website is https://www.kashyapeesays.com. i had my site up and running since yeterday. Bit the problem is when I logged in today I can't see anything in the dashboard except news and events, recent activities. All the tools, setting, posts and all other options on the dashboard are missing. Also the jetplack plugin leads me to another page asking me to connect to wordpress.com. when i try that it says my account is already connected with another site. Please help. We have a full guide on common WordPress troubleshooting techniques, which is the best place to start analyzing what might have gone wrong. If Clef is no longer loading, then it should not be asking you for 2-factor authentication , then you should be able to login to the dashboard using the normal URL (http:// your domain here/wp-admin). You will still need your admin and password. If you're still seeing the remnants of Clef, then you may need to remove it from installation. Here's a tutorial that walks you through the process. I think this one is simple, it is not a tough work. I installed a wordpress theme from instaniche. it is a set plugin that is a full website. Now when i log into my wordpress admin for the site, i cant get to the dashboard. I get the website itself. How do I fix that. I accidentally deactivated something. I clicked the wrong thing and now my site is stuck with a template website that i was trying to put in a subdomain. You haven't given us enough information to assist you. What is your domain name? I have succussfully logged in to Boldgrid and posted a few web pages. Now I would like to login to WordPress' dashboard. However, you provide the same address (/wp-admin) for WordPress as Boldgrid. Is there a different login? Or once I login to Boldgrid, can I change to WordPress format? Hi! BoldGrid settings can be changed to restore the WordPress Admin Menu. I started my InMotion account on Sep. 19 and wordpress is pre-installed. I got the url of admin dashboard from the welcome email, but it dis not work. I got the 404 error when I accessed the wp-admin page. My domain is drs.network. Please let me know what should I do. Thanks. It appears your domain is not pointed to us and you are not using our nameservers. When visiting the temp url I see the WordPress website. Here's our guide on <a href="http://www.inmotionhosting.com/support/domain-names/dns-nameserver-changes/what-is-a-name-server">setting the nameservers</a>. Google generally does not index admin pages for sites so you will most likely be unable to find your admin URL in a google search. Wordpress by default will have the login page as yourdomain.com/wp-admin , however, depending on the plugins on your site it could have changed the URL. If the /wp-admin URL is not working for you I would recommend disabling all plugins and themes on the site to see if you can regain access to the wp-admin page. Yes, you're correct. This article is in the middle of the WordPress instructional series. I suggest starting with our full guide on how to install WordPress. I have just started a wordpress premium blog yesterday. I cannot access my Wordpress Dashboard. Please help. I'm not sure what you mean by a "WordPress Premium" blog? Did you create a blog at WordPress.com or did you use the self hosted version from WordPress.org? I created and account and installed wordpress with website domain (gracemall.org). At time of creation of the account the domain was hosted at a different place. I changed nameservers to Inmotionhosting.com. I can't get into the admin area. What am I doing wrong? It hasn't been 24 hrs since I changed the nameservers and I was thinking since the domain had arrived to Inmotionhosting that he WordPress admin would work. Any help would be appreciated. *Just for a note, I have another add-on domain installed and it's working fine. Do I need to delete the non working install and reinstall wordpress? It looks like WordPress did not completely install. I'd suggest deleting this install and try again. We need more information. Whats your website URL? Today I tried to access it and received the following error. I hope you can help. It is possible thogh to acess the site itself. /wp-admin works for me. IT's likely your login was disabled for a short period of time via Mod_Security to stop a brute force login attempt. It was probably what you say, since now it works for me as well. As a test, try disabling mod_security rules in cPanel. If your problems persist, I recommend following our WordPress Troubleshooting guide. cliffbattley.com.au using the /wp-admin suffix but I keep getting an error message which says "This server cannot find the requested page"
/wp-admin works for me. Are you still having the issue? so i tried to do a restore backup wp in the restore/backup arear in my cpanel but the backup has been removed. We are happy to help but will need some additional information. Can you provide the domain name of the site for us to test? May be I do not really understand the difference between wordpress login the (wp-admin) stuff and cpanel. Do they have any relationship? Now straight to the point is, I want to use emails alot on my site which was just recently built using wordpress. after watching your tutorial, I got to realise there is another stuff as cpanel and I will need to login to it inorder to be able to set up my email on wordpress. I tried to work round it but appears the less i understand whats going on. I already download and activated the Easy WP SMTP. Please, how do I find myself through with the cpanel so I can be able to use my emails? I want to be sending and receiving emails from my site. Essentially, WordPress is installed in your cPanel. Your cPanel, often referred to as control panel, is the interface used for making changes to and customizing your hosting account with InMotion. Read more in our full article what is cPanel. To use email you must create the email address in cPanel first. Then you can view your email settings (including outgoing SMTP) at any time. You can check your email using Webmail, or setup an email client such as Outlook, MacMail, Thunderbird, etc. Please assist with the below error showing while uploading a theme bought from Envato Market. Your theme is missing files. I'd attempt to re-download it from Envato and try to install it again. If that doesn't work you may need to reach out to Envato for assistance. I don't have a dashboard for my WordPress site and can't figure out how to install it. If you loaded the stand-alone version of WordPress (from wordpress.org), then the dashboard is already loaded. You don't load it separately. If you created a WordPress.com site, that's something different. WordPress operates based on the URL that you specified when you installed it. If you are an InMotion Hosting customer, you can easily speak with our live tech support team for more assistance. Please provide us more information if you continue to have problems with logging in. I have tried couple of times to log on to the wordpress dashboard but couldnt. When I tried to clicking on the admin url from my emails to log onto the wordpress login page but could not. it is giving me this error message "Server DNS address could not be found". Please help me get this problem out so I can log onto my workpress dashboard and create my website. You will need to allow a few hours (somewhere between 4-24 hours) for the domain to propagate on the web. If you would like to get started right away you can do a hosts file modification to access the domain right away. You will need to check with your GoDaddy domain account and ensure your domain is pointed to your Bluehost server. Apologies for the problems with the login. If you're having problems with the login and you're not the administrator, then you should contact your administrator. If you are the admin, then you may need to trouble plugins or review your documentation as HTML code is NOT required to login to WordPress. hi I recently set my pages to private, and now i can't access my wp-admin login to gain back end access to my dashboard. can someone plz help? Are you unable to see the login screen at all, or are you having trouble with the password combination. If the latter, there are many ways to reset the password outside of the admin area. We also have a guide concerning common WordPress troubleshooting techniques. The schengenvisaflightreservation.com/wp-admin is not working because the wordpress expert has changed this link to something else to make it difficult for the fraudsters to access the backend. Now that he has left I do not have access to that link. Is there a way I can get to that link and login to my wordpress backend. Thanks! You can disable that plugin, but you would need to know the admin URL to get into the WordPress to do so. You may be able to see what the URL was changed to if you have an .htaccess file for your account. It is possible it would have a rewrite rule that gives the URL for the admin area. I can get on my dashboard, but nothing is there except a word press news link, where is all my website orders and plugins info and everything else, it is blank! Please help! Sorry for the problem with your WordPress login. Unfortunately, we can't determine what's wrong with your site without seeing it. Please provide more information on the issue such and the URL for the site if we are your hosting service. If you can provide this information, then we can look further into the issue. If you are not the administrator for the WordPress site then you will need to use the forgot password option on the login screen. If that is not working for you, then you will need to contact your WordPress admin. You would need access to the WordPress files and database in order to reset the password manually. You can see more information about it in the WordPress codex. I have one administrative login for the WordPress Dashboard. Yesterday, I have created another user login for maintaining my website but that username and password cannot make admin changes. You will want to make sure that the new user has been assigned administrator privileges. This can be done by logging in as the main administrative user and changing the privileges for the new user. My website has been working without issue for a few years but now returns a server didn't resond error. Not sure how long it has been down, maybe 6 months? I also tried to get in to wp admin with same error. This is a DNS issue not specifically related to WordPress. I advise contacting GoDaddy since the domain appears to registered with them. I signed up few days ago and I called in today to find out how to start creating a blog using wordpress. I have domain with previous hosting that I am keep using. Instead of utilizing the transferring service, I will start creating a blog with the domain. I was given a link to i guess temporaly wordpress till I am ready to go on public while keeping the previous website I have. I cannot login to the dashboard, as I do not know my login name and password. Could you tell me where I can find them? You can view your username/admin email address in the database, then use it to send you a password reset email. To view your admin email address Log into cPanel, Under the Databases section, click on phpMyAdmin. Click on your wordpress database, then click on wp users table. You will then see your username listed in the "user_login" table, and your admin email address listed under "user_email". If you need assistance, Live support can help you locate the username or reset the password. Hi. I'm a designer with HTML, CSS and JS experience but I'm new to WordPress. I want to help someone change their Wordpress theme and make some changes to their existing site, wich is hosted by BlueHost. My question is: Do I have to install WordPress from cPanel, or should I be able to login to WordPress admin Dashboard using www.site.com/wp-admin without installing WordPress on my end? Would I be removing any admin rights from other users if I install WordPress on my end using their existing domain? Thank you so much for your answer! WordPress will have to be installed somehow first. I am not sure how bluehost handles it, but typically you can install WordPress yourself, or if you need assistance our Live Support team can help you install WordPress. During the install is when the users are created. After it is installed you can log in successfully. Fred, I would recommend <a href="http://www.inmotionhosting.com/support/website/wordpress/resetting-your-wordpress-admin-password">resetting your WordPress password directly in your database, or one of the other available options</a>. Hey. I had a wordpress account then downloaded the Wordpress dashboard/server/whatchamacallit and now I can't log into my account through it. It tells me my email is invalid. Is there a way around this or am I going to have to remake my account? I regret that you are having trouble connecting to your account now, but I do not know exactly what you mean. What did you intend to download? how can I fix this. I am not an expert in this at all. It sounds like your theme is missing some files. I would try to re-install the theme again to see if that corrects the issue. i installed wordpress on my domain which i bought from other vendor (nameservers have already been pointed to inmotionhosting. but after installation, the page hooligan.co.in/wp-admin doesnt open. what is the issue here? The login works for me now. Sounds like this was an issue with propagation. It needed time to push the dns records for the domain to the world. Hey! I have a huge problem. I went to change the URL of my site from mydomesticdish.com to thecrunchycanuck.com and effed something up royally. Admittedly, I've not been sleeping and was distracted while I was reading a tutorial on it. I doubted it would be what I was supposed to do but I figured I would try, go back and set things back to how they were if it didn't work. I tried, it booted me out and I'm not sure how to reverse it now.Is there any change you're able to tell me what I did wrong or how to get back into my main dashboard to fix things? I had Jetpack set up and I can't even get back in there to try and do a reset on it. There's two settings you need to change in the database to change the Domain for your WordPress website. In the wp_options table, look for the site_url and home fields. Change those from the old URL to the new URL. It's that simple. If you need help, I'd suggest calling Support as it's a pretty simple fix for us. I am providing website building services with my partner. I am getting doing sales while he is doing the technical part. Recently, we had disagreement and i just realized that he never made me an admin of any website of our clients. I am just a moderator i guess. The hosting is registered under me. My question is, is there any way I can make myself an admin via the cpanel? We are not in talking terms anymore and my clients are chasing after me for some services. Here's our article on <a href="http://www.inmotionhosting.com/support/edu/wordpress/333-add-admin-via-mysql">Creating a WordPress Admin user in the database</a>. I installed wordpress yesterday at 11 am. Today at 3PM I am still unable to login to my dashboard. What kind of error are you seeing? Is it a password authentication, user/password incorrect type of error? I just purchased the hosting and during the process I selected to have my wordpress installed. It seems to be already installed but I have no idea what are the wp-admin username and password. How and where do I get that information? That should have come in your Welcome email. If you do not have that email any longer, contact Live Support and they can resend it to you. I am facing problem while opening the wordpress admin page. As suggested, I did copy paste all the wordpress files in the public_html folder (using filezilla). The site is opening without any error. But in order to make modifications to it, I am not able to access the wordpress admin page. Sorry for the problem with logging into WordPress. The error is basically saying that you're trying to run WordPress in an environment without MySQL. I would make sure of the system requirements for WordPress, and then follow the instructions for installing WordPress manually. There's a number of reasons this could be happening. What is your domain so we can look into it further for you? I am taking over the editing of our company's website. When I type boulderenvironment.com/wp-admin this message is displayed: Sorry, you can not sign this site! Please contact the site administrator to deal with! Please tell me the steps to enable me to sign in and take over. It seems to only be my computer having the issue. It looks like they have some security enabled. Its hard to tell without actually looking into the files how its set up. I'd suggest by looking into the .htaccess file to see whats in there. Thanks Tim, I'll have a look. I cannot log in the dashboard. Please help. Are you getting a specific error message? What happens when you try and log in? I had a wordpress.com site and I want to change to to a wordpress.org site. So i deleted my .com account and created a new gateway through softacolous. When I go to http://lizawick.com/wp-admin it says it cannot be registered because its already reserved. how do I fix this? I wouldn't midn changing my domain name is I can do it for free on inmotion. The login is working for me. Are you still having the issue? Its been two days since i signed up for wordpress well can update my profile and settings but cant see it keeps on loading and says DNS problem WHAT SHOULD I DO NOW??? Unfortunately without any specific information, I am unable to check on your situation. You will need to contact your specific hosting support and/or DNS authority to see if they can assist you. I have recently started using your hosting service and you guys were kind enough to install WordPress for me. Unfortunetly when i try to access my admin page "http://*********.com/wp-admin/" nothing happens. I see in the comments that it takes about 24 hours for everything to come together but it has been longer then that now. I'm curious if I should just wait longer or possibbly take other actions. Thank you! I checked your domain's DNS and it is pointed to godaddy. I recommend pointing to InMotion's nameservers, which will allow you to host your DNS with us. Here is a link to our guide on how to make DNS Nameserver Changes at GoDaddy. This should cause your domain to resolve to our servers within 24 hours (due to propagation). WHen I copy and paste the URL for a new blog post onto FB, instead of populating the image of the new post, it shows "Protected Blog> Log In" as the image instead. My blog is public, and I checked all the settings. I even cleared the browsing history. What else can I do so that FB picks up the image from my most recent post? Thanks in advance! Is this a WordPress.com website? It sounds like you may have the plage set to private so only editors and admins can see it. Hello. My Wordpress admin page is disabled - and I am not sure how to get into it now. How to fix it so that it not disabled? Sorry about the problem with your WordPress Admin page being disabled. I'm not sure what you mean by "disabled". Are you getting an error when you try to reach the page? Please give us a little information (such as the site URL and error message) and we can look into the issue further. i try going to the wp-admin and it just says that this page cannot be displayed. i had inmotion install wordpress when i bought it so it should be installed correctly. what is the problem? It should work without issue by going to the admin page (example.com/wp-admin) If it does not, then you will want to contact Live Support so they can fix that for you. I can't access the admin panel of my site because it has been flagged as containing malware. *********.com/wp-admin - How do I get in to access??? If you are unable to access the site due to malware, then the best thing will be to revert to a backup of the site if possible. Otherwise, you may need to reload the base files or try adding an admin account. I have instled wordpress but i am not able to reach dashbord . If you are getting a 404 error the files may be missing for your installation. I recommend re-installing WordPress. I got e new domain registered eypindia.info this morning. I was able to login to the WP Admin. But when I try to upload a Theme or Plugin from my desktop, it shows a page "THE EYPINDIA.INFO PAGE ISN'T WORKING". But when I upload a plugin from the available listed plugins from the dashboard, they are getting inatalled. I not able to understand why this is hapenning. Earlier when I was in shared hosting elsewhere, this problem wasn't there. That is nowhere near a normal problem, can you provide a screenshot of the error so we can investigate this issue. Tried to make a site using BoldGrid. It looked cool. It wasn't showing up on my domain. Instead the webpage had "bg_theblondeoutdoors.com" added to the .com name. I tried to change the settings from the main WP-login, and now that page just loops me to the BoldGrid login portion. Any idea how to fix this loop? That message indicates the file wp-login.php file is missing. I recommend re-installing the WordPress core files. Really very helpful process. I was looking for something like this. As I am a non technical person it worked for me. Thanks, really appreciate your work. I checked your installation and it is working. just type in www.powellriverfirefighters.ca/wordpress/wp-admin and it will show your login screen. If you're getting a white screen, login to your cPanel, go to the Software section and click on PHP CONFIGURATION. Make sure that you are running at least PHP version 5.5 If it's not set, then select the appropriate version and save the change. You should be able to login after. You can always call into our live technical support team for immediate on login issues such as this. They can help you get in if you require further assistance. I am not able to get to the WP log-in for my website, trinitymontrose.org/wp-admin, this has just recently occured, I was previously able to log in. The website was set up by a third party that passed it off to me for maintenance and updates. Can you help me out? Thank you for contacting us. What happens when you attempt to login? Do you get any errors? Have you tried Resetting your WordPress Admin? I can't seem to login to my dashboard. I put in xxxx.yyyy.net/wp-admin and get the login page. I then put in my username and password and hit return. The page just hang up without an error message. I've done this a dozen times on difference computers. I then clicked on 'forgot password' and got an email to reset my password. I reset my password. I then attempt to log in again with the new password but the same thing happens: the page just hangs up and won't give me an error message or anything. Please help! I need some way to get into my webpage! There are a few different ways to reset the password. I would try the Reset Password link again, but if that continues to not work you can try resetting the password in the database. THANKS!!!! Appreciate you guys taking the time to make these helpful videos!! I went to my website. so that where it says website.com you change to what your actual url is. then input your correct login information as well as password then click login without refreshing the page. If done correctly you will login to your dashboard and then from there you can change the wordpress url to the correct one under settings. I am seeing the base WordPress install at the domain itself: *******.com but the previous link you gave gives a 404, which means the folder no longer exists. That is because your domain is still pointing to HostGator. You will need to point your domain to our name servers in order for the site to show from our servers. I am seeing the Admin login page w hen visiting the wp-admin URL. Were you able to correct the issue? I cannot get to Wordpress to edit my content. I am going to www. ************.com/wp-admin, using my username and password, but then I get a Problem Loading: Connection reset page. Suggestions? Have you tried renaming your plugins folder? Check out our WordPress troubleshooting steps article, and you may be able to isolate the issue. I bought my domain 6 days ago and chose WordPress to be automatically downloaded to my domain; however, when I tried to log in to the WordPress dashboard today I can't log on using admin as user name and password. Please help! I don't know how can I log into my WordPress dashboard. Thank you! Thank you for contacting us. I recommend resetting your WordPress password. That guide includes four methods that do not require dashboard access. I have installed wordpress on my c panel .But not able to login on my dashboard ,the details are sent to my mail but on accesing the admin url it is saying server not found. my url is : http://**********.com. Sorry for the problem with the page not loading. When I looked at the issue it appears that the subdomain you used to install WordPress does not have any DNS values. You would need to make sure that "********.com" has DNS settings applied to it. For example, at InMotion Hosting, you can define a subdomain and DNS settings will be applied. This means that typing in that address in a browser will result in it being recognized on the internet. Please setup your subdomain properly, or add DNS settings. Bought my domain name a week ago ********ontheshelf.com, i still cannot log into the wordpress dashboard. can you please help. Are you still seeing an error? I am able to get to the admin page, but of course without credentials I am unable to log in. I am not seeing a 404 when visiting the login page, however. cannot be reached. Your comments? Thank you for contacting us. I tested the link you provided, and it is sucessfully displaying a WordPress login page. Are you still experiencing issues at this time? Thanks for deleting my comment. I solved my issue by myself. For whatever reason it's common knowledge that you point DNS servers from whatever site you bought the url to your current hosting site. It was not common knowledge to me. I could not find that anywhere in any steps until I randomly found the page somewhere on this site. When I login I am taken to a page that does not have the same dashboard as your video shows. It is so odd. I am taken straight to a page the has "My Account" written on the top. Any advice? Thanks! Thank you for contacting us. We are happy to help you troubleshoot further, but will need some additional information. Have you verified your domain is pointed to our servers? Are you able to see your site when you test on your Temp URL? Can you provide the domain you are testing? I am getting an Error 500 message when I select the Plugins menu item from my WP Dashboard. What can be causing this? The other menu items seem to work fine. Sorry for the problem with WP. It may be a plugin that's misbehaving that's causing the problem you're seeing. Try disabling all of the plugins and see if the menu works. Check out our guide to common WP troubleshooting techniques. It will show you how to disable the plugins manually - if you're not familiar. You may then need to restore the plugins one-by-one in order to determine the problem. I bought a domain 48 hours ago from another party. I installed wordpress on the inmotion hosting's cPanel and I still can't figure out how to log in. I've recieved the email confirmation of the wordpress installation. However, when I go to my wordpress admin page there's just a blank screen. My url is ******.com. Thank you! Thank you for contacting us. When I navigated to your site's login page (http://example.com/wp-admin be sure to replace "example.com" with your actual domain name) I am seeing a login prompt instead of a blank page. Are you still unable to login to your WordPress dashboard? I figured out my issue. There's a step missing concerning DNS servers. Thanks. thankyou..for this article..really helped me in saving my time in logging my wp. Are you logging in using the format www.domain.com/wp-admin? If so, the area you see there is the dashboard. You should have a menu over on the left hand side. If you do not see that, please let us know what you see. I see you've sent me the same link as you did before. Your instructions are not clear adn as such as not quite getting me anywhere. Are we able to do a LIVE CHAT to discuss this and so you are actually able to help out? Sorry for the problem with the login. We do provide chat with our live technical support team if you are hosted with InMotion Hosting. That is always an option as they are available 24/7. I was reading back through your posts and realized that you are dealing with a WordPress.com site. Your best bet is to contact WordPress tech support to give you a hand with getting back into it. We normally provide support for WordPress sites that are self-hosted (typically with another hosting company). WordPress.com sites are different from the Wordpress.org (stand-alone wordpress sites) sites for which we provide much support. Blog site that needs help: http://www. **********.wordpress.com issue: unable to login due to a secondary authentication plugin to send verification to mobilephone. phone number has since changed and i do not have the SIM. It just keeps going in a cycle wheere i try to login but it asks for verification code which is not received at my end... Goal: To be able to login to the backend and remove that phone verification plugin or update it to new number. Please advise how to do that. PLEASE HELP! Thank you for contacting us. We are happy to help you troubleshoot, but will need some additional information. What is is the specific phone verification plugin you used? Its the wordpress 2 step notification process. I do not have the backup codes and I can't remove the plugin till i log in to the backend. Do you know what I mean? Its a vicious cycle where it keeps asking me for a verification code thats sent to a mobile number i no longer possess. You can disable the plugin from within the file manager or via FTP access. Here is a tutorial on accessing and using the File Manager within your cPanel account. I paid to get my website done and this guy disappeared as soon as he got his partial money. 1) I need to get rid of logo (this logo is not mine) logo is in cpanel. Did not find in media gallery. I need to write text " KBS Indusstries" in place of the logo. 2) He has my competetor images in sliding , need to replace with mine and add few more sliding pictures. You may want to take a look at our WordPress Education center. There are many articles there about modifying your WordPress so that you do not need any a developer for it. As to your slider, this would be a plugin that you can modify so that you can change the images. The exact specifics may vary from plugin to plugin. my company is call MAid On call, so I enter maidoncall.ca/wp-admin , and it tell me error 404 , can be found , I dont understand why, and please I need your help. I looked at your domains source code and it does not look to be a wordpress website. Are you sure your developers used wordpress to build your website. Last week I registered www.crossfitwhitestar.com. I changed my primary domain from www.platoonpt.com to the new www.crossfitwhitestar. When I look in my public_html folder I see that all of the WP files are still there. I verified that the newest version of WP is installed, etc. BUT....I cannot access my WP-Admin. I can`t do anything. And when I go to www.crossfitwhitestar, the pages still show up as www.platoonpt.com. Thank you for your question. If the wrong domain is coming up, the WordPress URL most likely needs to be changed still. There are several ways to accomplish this, which are covered in our guide WordPress - Changing the Site URL and Home Settings. I purchased hosting a week ago and installed wordpress and could not log in. Because of the domain issue, and hoping it would solve my problem vs pointing, I transferred my domain 3+ days ago. I still can't log into wordpress. When I go to braintaffy.com/wp-admin as directed by my successful install, the page won't even load. (Originally between purchasing hosting/installing WP and transferring the domain, I did get a 404 error on that page, but now nothing.) Suggestions? The domain braintaffy.com is still pointing to Yahoo. If the domain is in transfer to us, the name servers cannot be changed until after the transfer is completed. At that time, you can change the name servers to point to us and then the domain should work fine. In the meantime, you can do a temporary fix by making a hosts file modification so that you can see the site as it will be. This will only work for you, however until the domain name server issue is corrected. Thanks for the question and sorry that you can't yet get into your WordPress dashboard. The main reason is that you just signed up and registered a brand new domain name. When you register a new domain name, it needs up to 24 hours before it is recognized on the internet. This is known as DNS propagation. The servers on the internet are still being updated with your domain name - it doesn't happen instantaneously. So, please give it a little more time and then you will be able to see your WordPress dashboard. If you cannot wait, you would need to change your WordPress settings to use the temporary URL. We do have instructions on how to install Wordpress to a temporary URL, but I would recommend this only if you're on a tight deadline. Once the DNS propagation period passes, in order to use your original domain name you would need to reverse the changes you made to use the WordPress site with the temp URL. I hope this helps to clarify the issue for you! Please let us know if you require any further assistance. I just signed up today and installed WP. Got confirmation email but when try to go to wp dashboard safari tells me it can not find server. Please help, anxious to get started. On STEP 1, it was not clear if the addition of "wp-admin" is on cPanel or the actual website, which you had opened after installation of WordPress.